Luna Bergere Leopold, the son of the famous wildlife ecologist Aldo Leopold (who wrote the environmental classic, A Sand County Almanac ) has been described by the American Geological Institute as one of the most distinguished earth scientists of the last half of the twentieth century. He was a leader in the development of a better and more quantitative understanding of streams and the landscapes they form. Luna Leopold's educational background reflects broad multidisciplinary interests. He received a bachelor's degree in civil engineering, a master's degree in physics and meteorology, and a doctor of philosophy (Ph.D.) degree in geology from Harvard University. This background paved the way for his creative and innovative approach to the science of hydrology . Throughout his career, water resources remained of vital concern to him. Luna Leopold is best known for his integration of engineering, science, and policy, but his legacy extends to environmental protection, land-use management, and watercontrol policies. He is shown here in 1979 near Pinedale, Wyoming. division from a data storage agency to one of the most respected research organizations in the world. 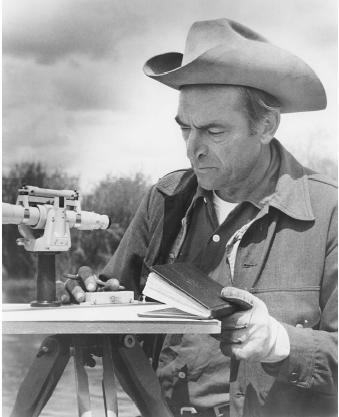 His 1953 paper "The Hydraulic Geometry of Stream Channels" is credited with introducing quantitative analysis into the study of streams and geomorphology . In particular, Leopold recognized a strong cause-effect relationship between stream characteristics and the development of stream channels. His work provided a framework for objective data collection on rivers everywhere and significantly increased the understanding of how stream systems operate. In 1964, he coauthored the book Fluvial Processes in Geomorphology that brought quantitative analysis to the study of landforms . Leopold retired from his position of chief hydrologist of the U.S. Geological Survey in 1972 and joined the faculties of the Department of Geology and Geophysics and the Department of Landscape Architecture at the University of California at Berkeley, where as of 2002 he was professor emeritus. Luna Leopold has published six books and 150 scientific articles, and is a member of the National Academy of Sciences, the American Philosophical Society, and the American Academy of Arts and Sciences. For his contributions to the field of science, Leopold received the National Medal of Science. In addition, he has received numerous awards and honors, including the Warren Prize from the National Academy of Sciences; the Robert E. Horton Medal from the American Geophysical Union; the Penrose Medal from the Geological Society of America; and the Ian Campbell Award of the American Geological Institute. Interestingly, Luna's sister Estella and his brother Starker also became members of the National Academy of Sciences. Membership is one of the highest honors a U.S. scientist can receive. Luna Leopold also is a well-known conservationist, having served on the Sierra Club's Board of Directors and the Board of Directors of the Environmental Law Institute. As of 2002, he was serving on the Board of Directors of the Aldo Leopold Foundation, Inc.
As an environmentalist, he is credited with contributing significantly to saving the Florida Everglades with his report "Environmental Impact of the Big Cypress Jetport." This report, which detailed the degradation of the environment, became the model for environmental impact statements throughout the country. SEE ALSO Douglas, Marjory Stoneman ; Everglades ; Geological Survey, U.S. ; National Environmental Policy Act ; Stream Channel Development ; Stream Erosion and Landscape Development . Leopold, Luna B. Water, Rivers and Creeks. Sausalito, CA: University Science Books, 1997. Leopold, Luna B., M. Gordon Wolman, and John P. Miller. Fluvial Processes in Geomorphology. New York: W. H. Freeman & Co., 1964.